The Tokugawa shogunate has isolated Japan from the rest of the world - but has brought stability and prosperity. The Bronze Age, rice-farming Yayoi culture is spreading throughout Japan. 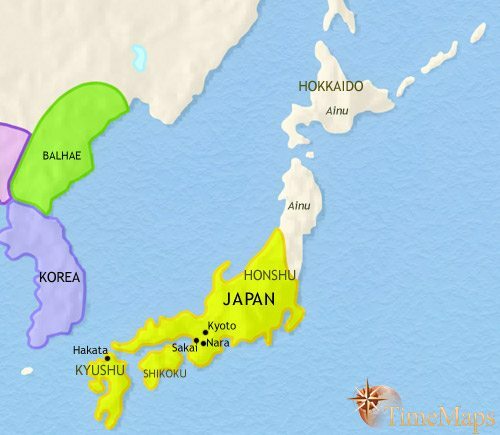 Japan is divided into numerous warlike chiefdoms. 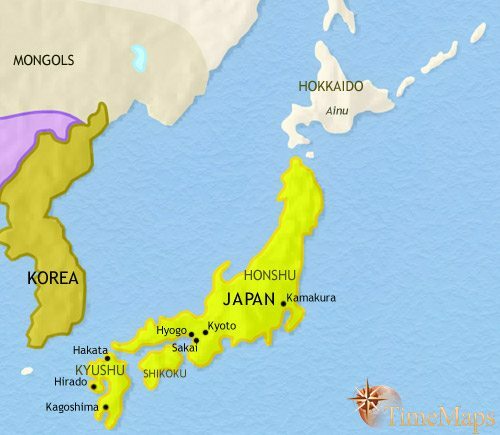 Japan is divided into numerous warlike chiefdoms, which have close links to Korea. In Japan, the numerous warlike chiefdoms have fallen under the authority of the Yamato kingdom. 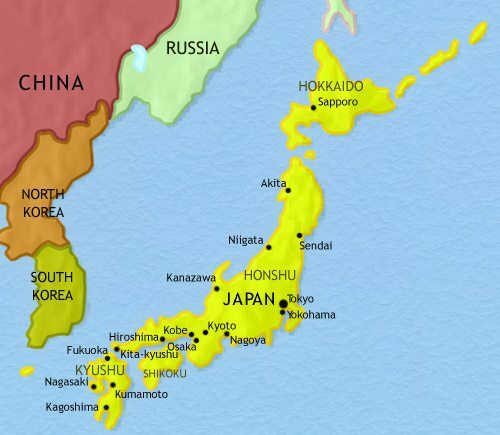 In Japan, a state modelled on Chinese lines has emerged. The Fujiwara family preside over a period in which the Japanese break free from the cultural dominance of China. A civil war has brought to power a military leader called the Shogun. Japan is slipping into a long period of civil war. 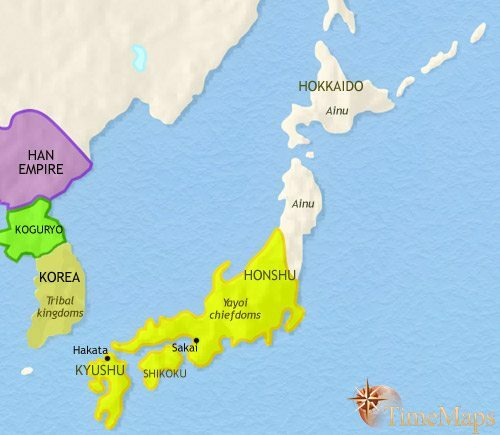 The Tokugawa shoguns have isolated Japan from the rest of the world. Japan's isolation continues under the Tokugawa shogunate, while the world changes around it. Japan has created a modern society in the space of one generation. Japan has become the first country in world history to have A-bombs dropped on it. Japan has become the second biggest economy in the world. The Tokugawa shogunate has continued to rule a Japan, which it has isolated from the rest of the world, bringing it political stability and peace. The long peace has resulted in greatly increased prosperity. A vibrant internal market has developed, centred on Edo and Osaka, both of which have grown to be amongst the largest cities in the world of the time (Edo is larger than any European city, with 500,000 inhabitants). As a result of commercial activity, new agricultural land has been opened up, and even the peasants have shared in the prosperity. This is also a time of cultural progress, seeing the rise of Kabuki theatre, known for its elaborate make-up and stylized acting, and Ukiyo-e painting. By this period, perhaps half of all Japanese, including the peasantry, are literate. There are danger signs, however. The growing population experiences more numerous years of food shortages, sparking off regular bouts of rural unrest. At the same time, economic changes have left segments of the population worse off. Many poor peasants have lost their land to big farmers, and many poor samurai have fallen on hard times, some even having to stoop to manual work to make ends meet. 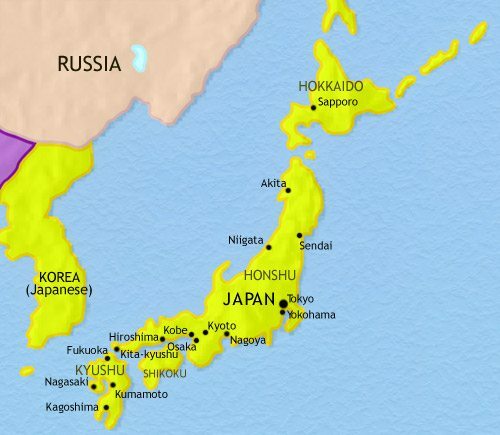 In Japan, wet-rice cultivation arrived in the island of Kyushu in the middle of the 1st millennium BCE, and since then has spread gradually north and east throughout the island. The new crop had been brought by immigrants from Korea along with a fully-fledged Bronze Age culture, which in Japan is called the Yayoi. Shortly after the arrival of bronze technology, iron technology also arrived in Japan, only a couple of centuries after its first appearance in Korea. This shows the strong links that now connected the two lands. 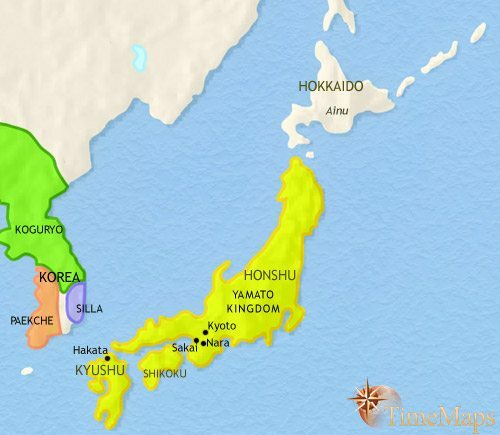 In Japan, the Yayoi culture, based on rice farming and possessing bronze and iron technology, expanded northward and eastward from Kyushu Island into Honshu. This led to a rise in population, and to increased warfare, leading to the rise of many powerful and warlike chiefdoms – Chinese chronicles of the period refer to the “100 kingdoms”. This situation is revealed in the remains of well constructed wooden hilltop fortresses dating from this era. At least some of these chiefdoms paid some for of tribute to the imperial Han court in China. By this stage, the Yayoi rice-farming culture covers much of southern Japan. To the north, the colder climate favours the persistence of the Jomon hunter-gathering culture, ancestral to today’s Ainu. Contemporary Chinese texts describe Japan as being divided into many militarized chiefdoms at this time. 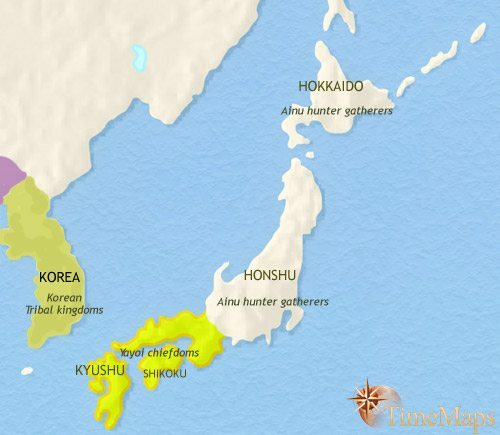 There are strong political and cultural links between the Korean kingdoms and the Japanese chiefdoms. In particular, Korean styles in weaponry and armour exert a strong influence upon the Japanese warrior class. In Japan, the numerous warlike chiefdoms have fallen one by one under the authority of one of their number, Yamato. As well as expanding in size, Yamato changed from being a traditional Japanese chiefdom to being a more centralized kingdom. Massive royal mound tombs, probably the largest in the world’s history, reveal the awesome power and prestige of the kings, as do the large-scale irrigation works constructed at this time. There were continuing strong links with the Korean kingdoms, especially Paekche, and it was from Korea that literacy, based on the Chinese script, reached Japan around 350. The borders of this kingdom gradually shifted northward, at the expense of the aboriginal peoples of the islands. The Jomon hunter-fishermen of northern Japan resisted the advance of the agricultural way of life, but rice-farming was finally adopted throughout Honshu by 300 CE. The colder climatic conditions of the more northerly island of Hokkaido favoured the persistence of the hunter-gathering culture, and here the Jomon tradition continued. These Jomon became the ancestors of today’s Ainu. The Japanese are rapidly becoming one of the most highly civilized nations in the world at this time, borrowing many elements from Chinese culture: script, artistic and architectural styles, and the Confucian education system. Buddhism is also making great headway. The imperial court of Japan is modelled directly on that of Tang China, and the Japanese government has started sending emissaries to the Tang emperor. The Taika reforms (646) aimed at creating a Chinese-type state. A Confucian bureaucracy was established, along Chinese lines, and a centralized revenue-collection system set up. All land was claimed to belong to the emperor; large estates were abolished and some land redistributed to peasants. In 710 a new capital, Nara, was built, modelled on the Tang capital of Chang-an, and this period in Japanese history is known as the Nara period. The Japanese capital was moved from Nara to Kyoto in 794, a move that more or less coincided with the rise of the noble Fujiwara family to power. Although the Yamato emperors have continued to reign, it is the aristocratic families, grouped around the Fujiwara, who now wield real power. They preside over a period of great artistic and literary achievement, called the “Heian” period, in which the Japanese establish their cultural independence from the Chinese and develop in new directions of their own. The peace, prosperity and a brilliant court culture continued under the Fujiwara regents. However, the political and social world of the nobility was focused on the sophisticated capital, Kyoto, where they spent their lives. The countryside was unseen and ignored. Increasingly unruly and anarchic, it saw the rise of groups of warriors employed by the nobles to look after their interests in the provinces. These were the early samurai. Civil wars broke out, resulting, in 1185, in the establishment of a military government. This is called the Kamakura shogunate, after the new capital from which the military dictator (shogun) exercised power. Its rule has re-established peace throughout the country, but henceforth the imperial court and nobility have lost most of their power. This has passed to the shogun and his samurai followers. The Kamakura shogunate brought a large measure of stability to the country and succeeded, with the help of a typhoon, in repelling the Mongol invasions of 1274 and 1281. 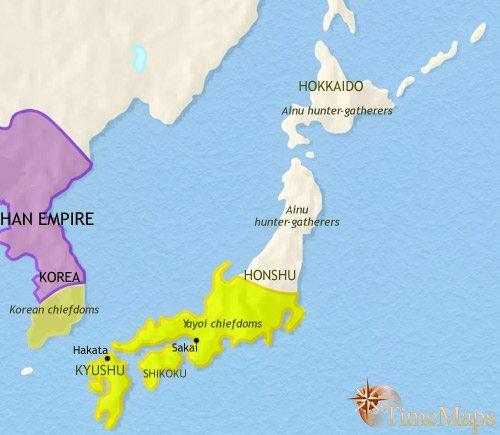 It has been replaced since 1336 by the Ashikaga shogunate, which differs from its predecessor in being more closely associated with the emperor and the imperial capital. The power of the Ashikaga shoguns is being weakened by regional revolts, and the provincial governors (daimyo) are slipping out of Ashikaga control. This is a period in which contacts with the outside world develop, with China and Korea especially. Japanese merchants –and pirates – operate along the coast, as far afield as Siam (Thailand). 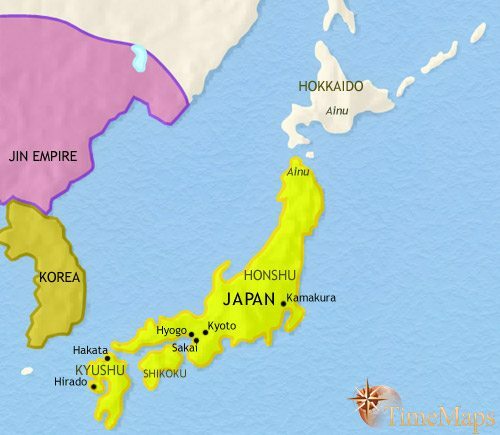 After 1467, Japan disintegrated into more than 100 years of civil war. 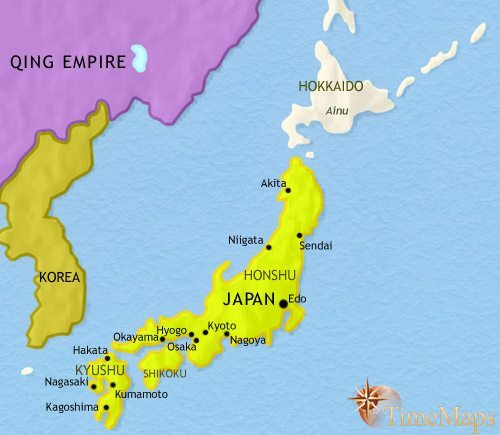 The daimyo governed their territories as independent fiefs, taxing the peasants and administering justice. This was the golden age of the samurai. It was a violent period, but one that saw the full development of the chivalric code of “Bushido”. This is an unwritten set of moral principles stressing frugality, selfless loyalty to one’s lord, mastery of martial arts, and death rather than dishonour. 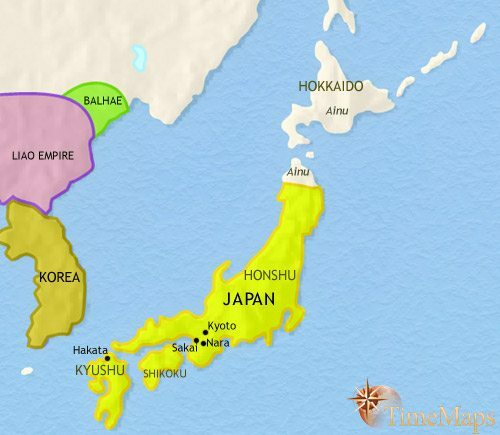 At length, Japan was re-unified, under the dictatorship of Hideyoshi Toyotomi (1590). Having secured his power at home, he led two great – but unsuccessful – campaigns in Korea (1592-3 and 1597-8), aiming to conquer China. Ieyasu Tokugawa then fought his way to the Shogunate (1603). He thus becomes the first of the Tokugawa shoguns. Under this, Japan has been organized as a federation of daimyo (feudal lords), under the shogun’s tight control. The daimyo are required to spend half their time at the capital, Edo (modern Tokyo), whilst leaving members of their family at Edo at other times, as hostages. The country is largely cut off from the rest of the world. Overseas trade has been severely limited, and the Japanese are forbidden to leave the country. In particular, Western influences have been surpressed: firearms have been outlawed and Christianity ruthlessly prohibited. In a sense the Tokugawa represents the high point of feudal Japan, with the anarchic forces of feudalism dragooned within a tightly controlled politico-social structure. Japan’s isolation continues under the Tokugawa shogunate. It is apparent to some Japanese, however, that the world about them is changing. Foreign ships are more frequently seen off the shores of Japan and, on one occasion (1808), a squadron of British ships enters Nagasaki harbour, looking for Dutch ships. There is a growing sense of unease in many quarters, encouraged by increasing famines and rising peasant unrest. In the field of medicine, for example, the first dissections allowed in Japan shows that Western medical knowledge is far in advance of Japanese. Japan’s seclusion was shattered by the arrival of an American squadron, under Commodore Matthew Perry, demanding the opening up of Japan to foreign trade (1853 and again in 1854). It was immediately apparent to the Japanese shogun and his advisors that here is a force against which they have no defence, and they sign a treaty of friendship and trade. By 1859, the US has been followed by several European countries, who have forced the Japanese into signing “unequal treaties” – trade terms very favourable to themselves. These developments undermine the prestige of the Tokugawa shogunate and, in 1868, a group of officials and daimyos around the emperor force the shogun to abdicate. After a short civil war, the emperor is restored to direct power, this inaugurating the period of the “Meiji Restoration”. In the name of tradition and national honour, the group around the emperor sets about one of the most remarkable transformations that any nation has ever known, as Japan begins the wholesale adoption of western technology. These years see the beginnings of modern Japan. Japan has been home to one of the most outstanding achievements in world history – the transformation of a feudal society into a modern, industrial one in the space of one generation. This is known in Japanese history as the “Meiji Period Restoration”. The aim of the group of Japanese government has been to end the “unequal treaties”. To do this, they have modernized Japan. They created a conscript army and a modern navy. They introduced a modern money and banking system, built railways and factories, imposed a western-style education system (Japan now achieves the highest literacy rates in the world), encouraged private ownership of land, and promulgated a constitution modelled on that of the German Empire. The “unequal treaties” have, one by one, been ended, and has gained an overseas empire: a war with China (Sino-Japanse War, 1894-5) gave it Taiwan and other territories, and Japan’s astonishing victory over the huge Russian empire (Russo-Japanese War, 1904-5) announced to the world, in clear tones, that a major new power had arrived. 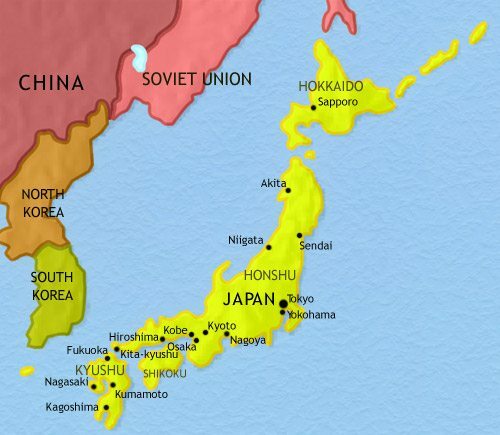 In 1910 Japan annexed Korea. The achievements of this period make Meiji Japan one of the most extraordinary episodes in world history. The Great Depression of the 1930’s created major economic problems for Japan, and undermined faith in civilian politicians. From 1932 the military dominated the government. They secured the take-over of Manchuria, drew up plans to create an “East Asian Co-Prosperity Sphere” to give Japan the raw materials she needed, and from the late 1930’s, mounted a major invasion of China. Then, in 1941, they brought Japan into World War 2 on the side of Germany and Italy against the USA, Britain and Russia. After spectacular initial successes, the war turned against the Japanese, and they fought a bitter retreat against ever more powerful Allied forces. The final phase of the war saw Japan pulverized by Allied bombing, culminating in the dropping of the A-bombs on Hiroshima and Nagasaki in 1945. 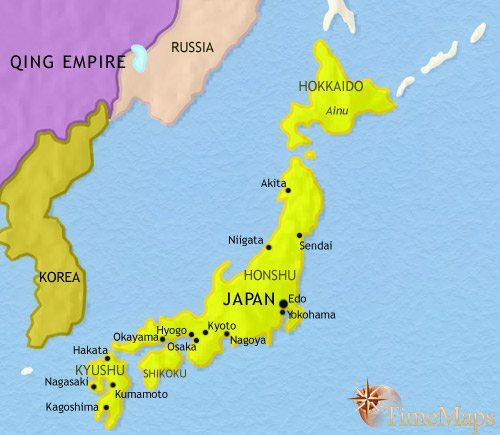 After the war, Japan was occupied by Allied forces until 1952. This occupation saw the setting up of strong democratic institutions, and the introduction of a raft of social reforms that have laid the foundations for a modern, egalitarian society. Since the end of the occupation, the Japanese have been engineering a dramatic economic recovery. The Japanese continue to build their industrial and commercial power, until they have become the second biggest economy on Earth. Politically, some high profile scandals mar the 1980’s and 1990’s. Then a stock market crash, followed by a decade of flat economic growth from which the country has yet to fully recover, has taken some of the shine off post-war progress. Nevertheless, Japan remains the second largest economic power, and its people the wealthiest, on the planet, and it is beginning to take a more active diplomatic stance on the world stage.